Couples get a 50% off discount to hand make sterling silver bands together in our jewelry studio. Partners discover new abilities to create rings together under the guidance of a professional jeweler. No experience is needed. Registration is required. Designer goldsmith, Dan Balk is enrolling beginner students, hobbyists and the artistically adventurous to hand make silver jewelry in his studio. Students discover new abilities to design and create jewelry under the guidance of a professional jeweler. Jewelry making classes are taught by artist and designer goldsmith, Dan Balk. Dan is inviting couples to hand make rings in sterling silver. Participants discover new abilities to design and create jewelry under the guidance of a professional jeweler. 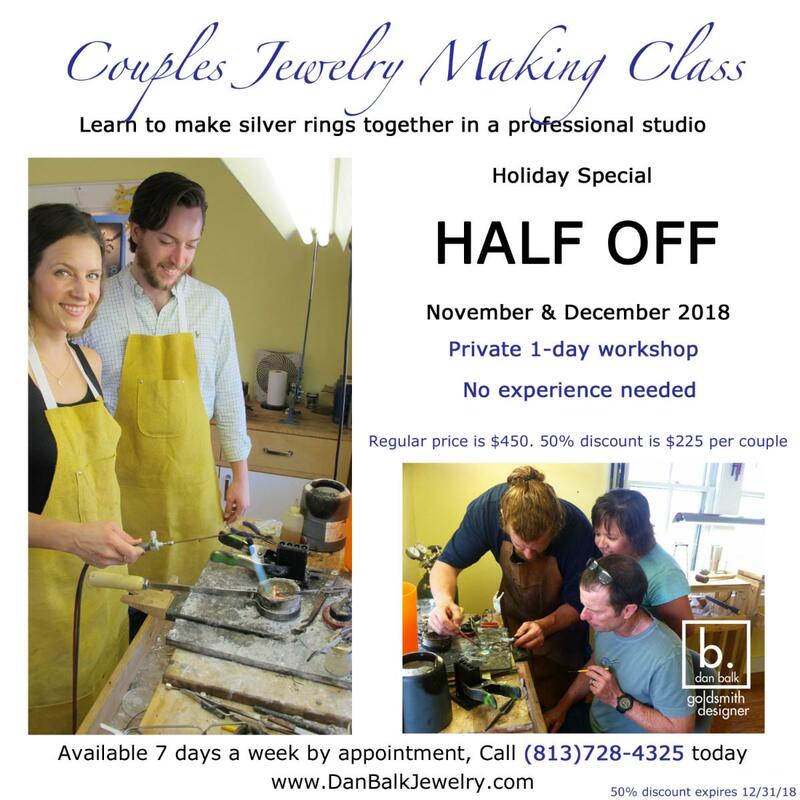 Dan Balk Jewelry Studio is offering a holiday special for the Couples Jewelry Making Class. If you book your private class before December 31st, 2018, he will give you a 50% discount (A savings of $225.) The regular price is $450. With the holiday special, the price for the class is $225. The offer expires 12/31/18. Supplies are included. Silver jewelry making classes are taught by artist and designer goldsmith, Dan Balk. Dan is inviting couples to hand make rings in sterling silver. Participants discover new abilities to design and create jewelry under the guidance of a professional jeweler. Dan Balk, has opened his jewelry studio for basic silversmithing classes 7 days a week by appointment, Monday through Saturday from 9:00 AM to Noon or 6:00 PM to 9:00 PM and Sunday from 10:00 AM to 1:00 PM. No experience is needed. Reservations are required. Each class is approximately 3-4 hours long. Students learn about jewelry in Dan’s fully equipped studio. Each class is private, enabling each participant to learn skills and techniques. Students will go home with their finished rings.